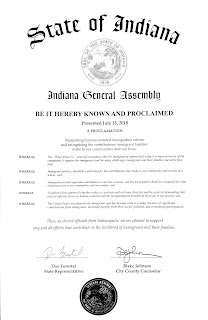 Recognition: City County Council & Indiana General Assembly Recognizes What About Us? Rally for Taking Action! You may have heard the old adage, "If you see something, say something!" Enrique Gonzalez and I, and many others have witnessed the grave (sometimes fatal) injustices that are occurring because of flawed immigration laws. Rather than seeing something and only saying something, we took action with the launch of our "What About Us? Peaceful Resistance Rally for Immigration Reform." We are honored to have been recognized for doing so as seen in the proclamation's we received from both the City-County Council as well as the Indiana General Assembly. 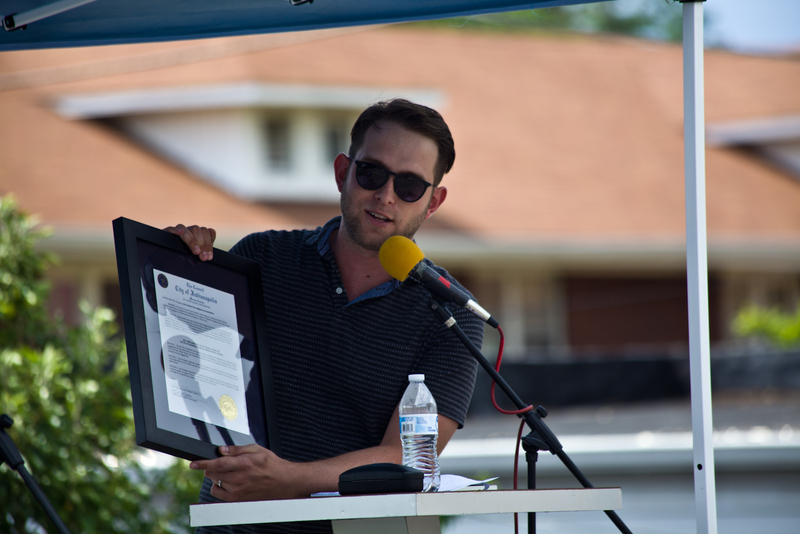 Thank you to our State Rep. Dan Forestall and our City-County Councilman Blake Johnson, and council VP, Zach Adamson for the incredible honor of being recognized for our work to stand up against the injustice. 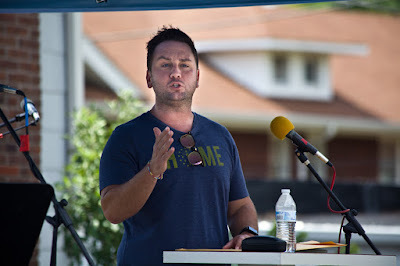 The My Christian Park Neighborhood Association Founding Board Members voted to support our efforts in addressing this issue with the launch of the rally we held in the nearby neighborhood of Irvington. 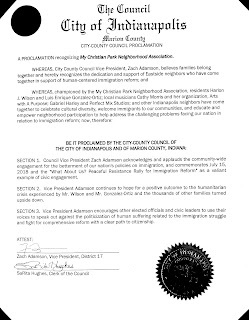 In recognition that Indianapolis eastside neighborhoods are reported to be the highest density of Latino population in the entire city (approx 30%), we felt compelled to do something to bring awareness to the grave injustice of family separations! 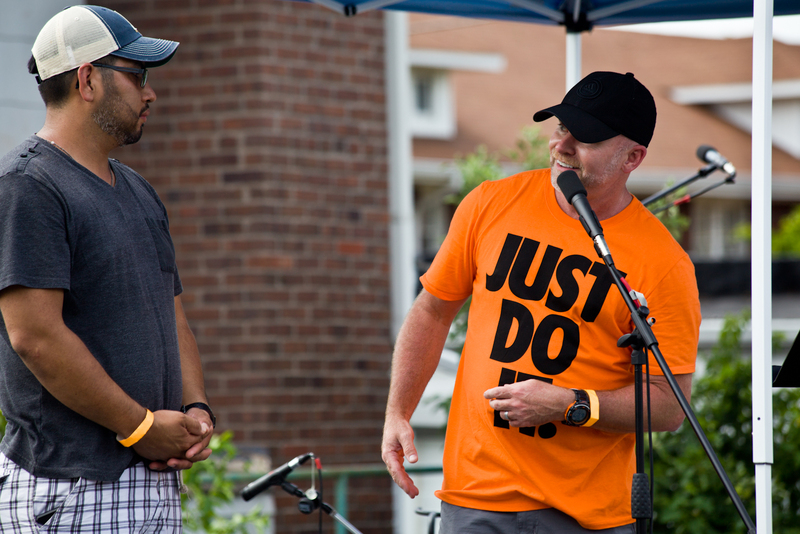 We rolled up our sleeves and took our story (and the stories of many other presenters) to the streets of Irvington in our July 15, peaceful resistance rally. As an active member and co-chair of a task force that is sculpting the revitalization of the nearby Twin Aire community, I've attended countless meetings where community leaders have worked hard to address issues facing the Hispanic population. Efforts like the rally and the work we're doing in the community, as well as our work through our company Home Redevelopment Solutions which helps sponsor much of our efforts, we are working continue our efforts to educate the public about the challenges facing the unique population. Marriage doesn't matter. The current administration's efforts to deport as many undocumented individuals as they can indiscriminately - the "zero-tolerance" policies of the administration are harsh in the attempt to enforce inhumane laws without consideration of the many other factors that way into a person's life, relationships, prior contributions, well being, and safety. The tearing apart of lives also impacts the community which in some cases has resulted in neighbors rising up against the injustice. However, nothing has stopped the deportation force. For Enrique and I, the most hurtful response comes from those who say, "Illegal is illegal!" Many have suggested, we should be able to stay but "...all the others must go and come back the right way." As hypocritical as the sentiment is, there is no right way in the Trump administration. The perception that the law is the law is admirable, and no one would disagree that we must have fair and equal protection. Therefore, the laws must change. The harsh stance of most who support deportation are generally people who are not fully informed about the reality of the many unique circumstances of each individual case. Further, it's an inhumane stance when it comes to people who have been in the U.S. for years, attending school, working jobs, contributing to the income tax base, building companies, having families and building homes for themselves. The final common question, "What can I do to help?" is simple and is something everybody can do and it starts right there in each and every home. That's right - even you dear reader can be a part of the solution. "Kindness & welcome towards neighbors!" On July 15th at our IRV rally, we called for area neighbors to make individual efforts to reach out to your next door neighbor to let them know they are welcome in our communities! Extend a helping hand of kindness to reduce the fear, pain, and turmoil, so many are facing. While Enrique Gonzalez and I aren't out of the woods yet as we are currently protected from ICE, thanks to a judge agreeing to hear our case, our hearts go out to all the people who have already been unjustly separated from their families, friends, neighbors, communities, jobs (sometimes small businesses they own like ours), and homes. This post is a reminder we must all love more and extend a helping hand to those in need. It's not a cliche. It's not something you should just read, comprehend as a nicety, and then dismiss or forget. Unfair separations and deportations are something everyone should be concerned about. A government is tearing lives apart. This post is a reminder that kindness and welcome are two strong actions every neighbor can take to help the immigrants living right next door. Get up and go knock on someone's door today! Thank you to Rep. Dan Forestal , Blake Johnson, and Zach Adamson, and all our sponsors including Lincoln Square Pancake House, Jockamo Upper Crust Pizza, McGuire Scenic, Indianapolis Public Library Irvington Branch, Irvington Presbyterian Church, Cathy Morris and Arts With A Purpose, Gabriel Harley Band and Perfect Mix Studios, and all the volunteers (a special thanks to Detective Jackie Phillips-Stackman), speakers, musicians, and performers. And a special Thank You! to the My Christian Park Neighborhood Associations founding board members who courageously took action for a day of hope, education, and peaceful resistance in acknowledgment that a change is warranted for this very divisive issue that obviously impacts our community. Immigration laws must be overhauled to be more human-centered. We must not allow further separations and deportations in our neighborhoods. If the courts deny our plea to stay in the U.S. and we are then deported into harm's way in El Salvador, if we lose everything (our home, our business, our income, proximity to our friends and family, etc. ), this administration will have gotten it all wrong! The injustice (and our potential harm) will be on the hands if the U.S. Gov't. As in the case of the many families already torn apart by deportation, our hearts remain pained by the loss! We must not forget those who have already been and/or will be ripped apart from their loved ones and sent to live in deplorable conditions. We must stand up for change. This acknowledgment of our esteemed local leaders inspires us to do more. If you see something, say something! Roll up your sleeves and get involved in building the community you want to be a part of. Failure to get involved is a form of acceptance. Please consider joining us in the next My Christian Park Neighborhood Association Meeting to help sculpt our future community together.